It seems far-fetched, doesn’t it? But, actually, it’s not. It’s all about science. Once you know the science behind butter, you can make it any time. 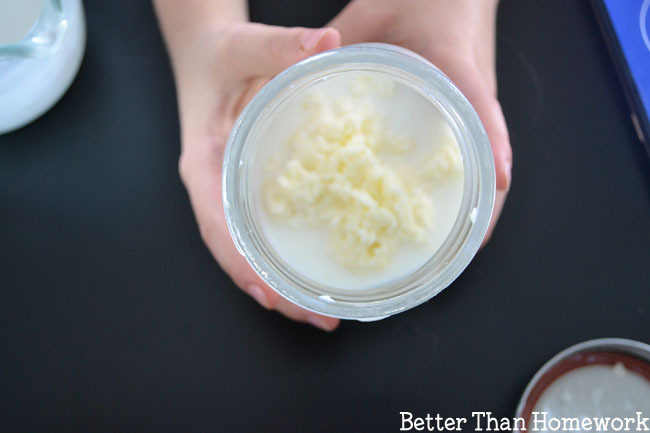 All you need are a few simple supplies to do this fun kitchen science project. My girls and I have been reading the Little House series every night at bedtime. I loved this series as a child, and I’m so happy to be passing along this series to my own kids. They love it too. The many detailed descriptions of pioneer life in the books has inspired us to do a few science experiments. 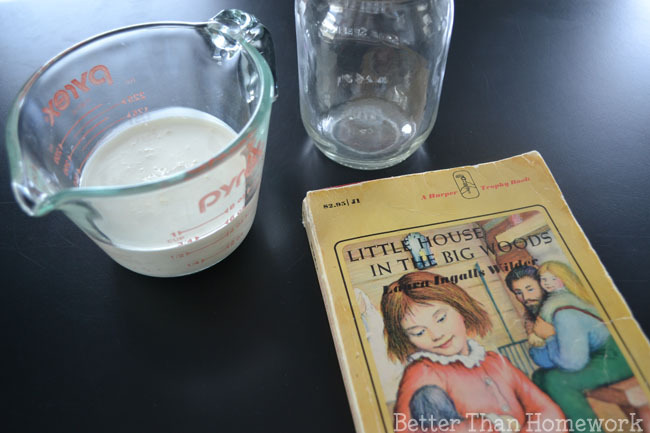 We were struck by how many times the Ingalls family had to make something that we are used to buying in a store, especially some of the food products, like butter as described in Little House in the Big Woods. 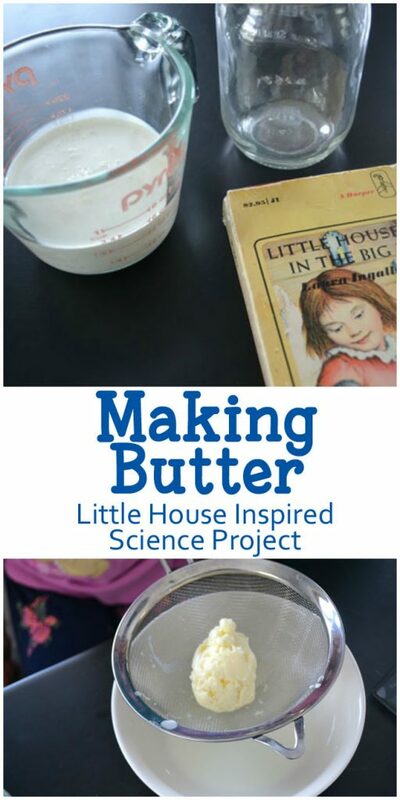 Ma didn’t know the science behind making butter when she taught Laura and Mary how to do it. But, science it was. You don’t make butter by mixing together a few ingredients. You make butter by changing one ingredient, cream, into something else, butter. You only need a few simple supplies for this project. 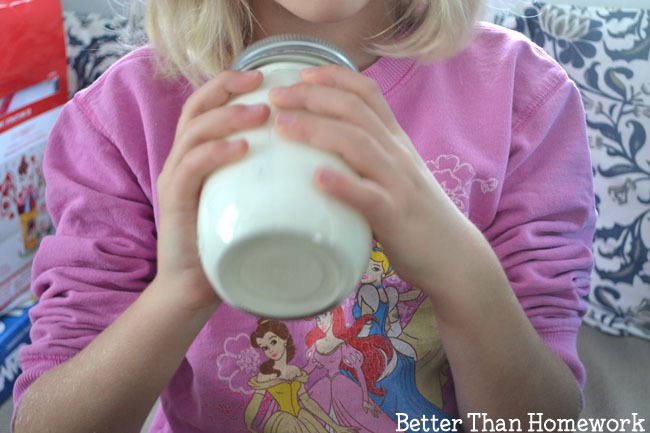 The most important supplies are some heavy cream and a mason jar with lid. You will also need a measuring cup and a strainer. To add a bit of math and technology to the project, have a timer or a timer app on hand. Use your measuring cup to measure 2/3 cup of your cream. 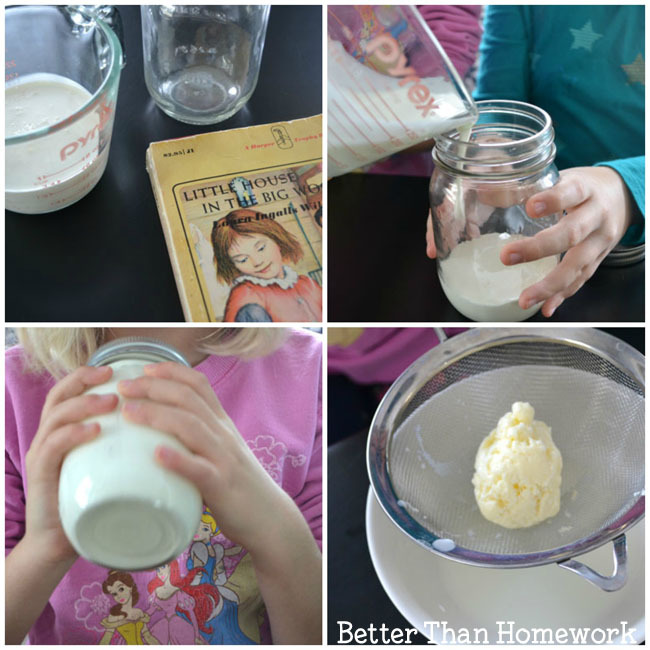 Pour the cream in the jar and put the lid on tight. Now, it’s time to shake and you’ve got to shake a lot. We passed it around between three of us, so no one got too tired from the shaking. We used a time app on my phone to see how long it took us to make butter and it came in at a little over 8 minutes. That’s a lot of shaking! What does the shaking do? While we were shaking, the molecules in the cream were moving around. The agitation caused the fat molecules to separate and join together. We accomplished this by shaking a jar. Ma, Mary, and Laura accomplished this with a butter churn. The motion of the churn’s stick moving up and down had the same effect as our jar shaking. Our cream started out as a liquid and as we shook it started transforming. When we stopped hearing the liquid move around, we stopped to observe what was happening. We took a peek and found whipped cream. When you hit the whipped cream stage, you’ve got to keep going. The shaking is harder to do, so shake as hard as you can. Suddenly, in a split second, everything changes. You’ll hear a solid substance plopping about inside your jar. Stop the timer, you’ve got butter. You’ve successfully rearranged the molecules in your cream. 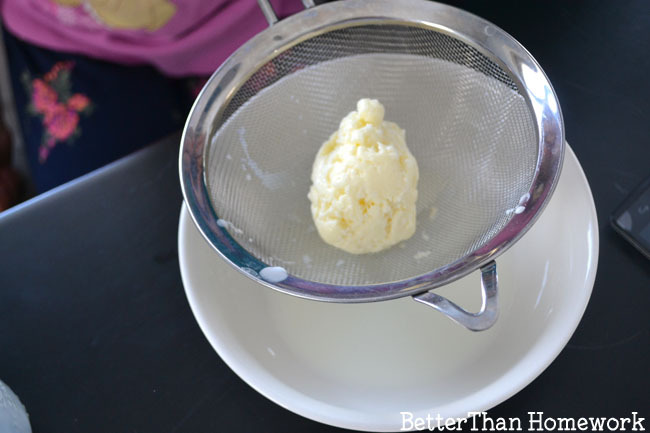 Once we had butter, we opened up the jar to see the butter sitting in a liquid. 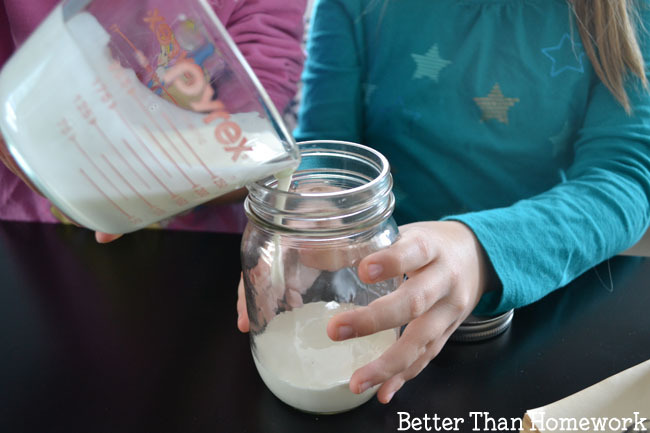 We took it one step further and used our measuring cup to see how much buttermilk we had. We measured 1/3 cup of measurement. So our 2/3 cup of cream split in two. One half was fat molecules which made our butter and the other half was the remaining buttermilk. You’ve just made butter. Can you believe it? 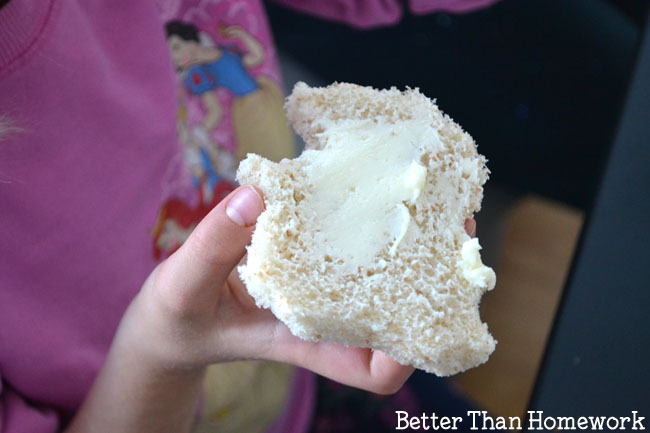 This is one science experiment that results in a completely safe and edible product. So get out the bread and spread a little butter on it. You’ve got to taste your results. 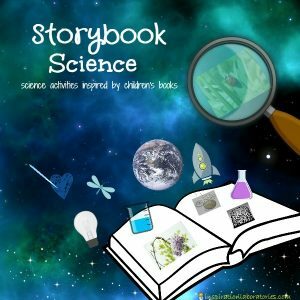 We did this project as part of the Storybook Science series from Inspiration Laboratories. Click the image below to see all the science projects inspired by favorite children’s books. If you enjoyed this post, the above photo is perfect for sharing on Facebook. Or, you can Pin the image below.